Since late September Russia has flexed its muscles in a bombing campaign across the war-torn country that has put a US-led coalition in the shade and angered Washington and its allies. The dramatic military campaign is Moscow’s first outside the former USSR since Soviet troops went into Afghanistan in 1979 and has led some to suggest that an emboldened Kremlin is aiming to reassert some of its lost super power status. Using the latest Sukhoi jets and older Soviet aircraft, Russia has blasted command posts and training camps of what it says are radical “terrorists” as it has backed a ground offensive by the forces of its long-standing ally, Syrian President Bashar al-Assad. 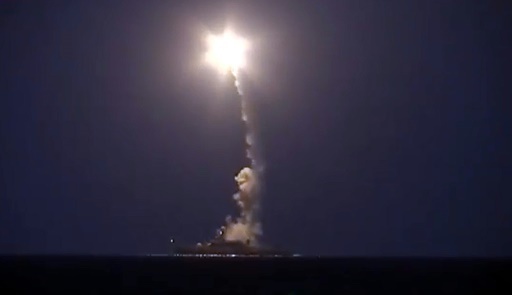 The strikes also saw Russian warships in the Caspian Sea fire missiles at targets over 1,500 kilometres away for the first time ever in battle — a highly symbolic show of strength that has been interpreted as a clear statement. With the Syrian campaign, Putin has come back in the limelight of international politics after having been snubbed by the West for the annexation of Crimea from Ukraine in March 2014. “He wasn’t planning on living in isolation, on leading an outcast state,” said political analyst Alexander Baunov of the Carnegie Moscow Center. With more than 70 percent of the Russian population on board with the intervention, the West has questioned the true motives behind the campaign, accusing Moscow of bolstering Assad’s beleaguered regime by targeting opposition-held areas. But quashing the Islamic State and other extremist groups, the stated objective of Russia’s campaign, is partly a broader attempt to compete with — and even intimidate — the West, analysts said. “Rather than being primarily about Syria, or primarily about ISIS, this dispute is about a global principle,” Matthew Rojansky, the director of the Washington-based Kennan Institute, told AFP. But Russia’s demonstration of military strength comes when the country is profoundly weakened by an economic crisis spurred by low oil prices and Western sanctions, with analysts warning that costly attempts at regaining international prestige could prove catastrophic. The Kremlin has kept the army high on its agenda in spite of economic woes, with a record-high 3.29 trillion rubles ($53 billion at the current exchange rate) defense budget this year, a figure that corresponds to more than four percent of the country’s GDP. Analysts said a long Syrian campaign could cause more economic turmoil for Moscow, a risk authorities and the population are ready to take — but only for a triumph on the international stage. “The people will not tolerate economic hardship for the sake of a war against ISIS, but it will for a victory over the West,” MÐµlamedov wrote. Russia’s attempts to reassert its status as a world super power has highlighted divisions in the Middle East, as many Arab countries have condemned Moscow’s campaign. “Sunnis want Russia to get out of there , but Shiites want Russia to stay,” Baunov said, adding that Iran, Iraq, Lebanon and pro-government forces in Syria supported the Kremlin. Political analyst Vasily Kashin said that the “inevitable consequence” of Russia’s Syrian campaign was the deterioration of its relations with Turkey, Saudi Arabia and Qatar, all part of a US-led coalition conducting a separate bombing campaign in Syria. Russia and Turkey have exchanged barbs since Moscow launched the air strikes and twice violated Ankara’s air space, with Turkish President Recep Tayyip Erdogan warning Moscow could lose a deal to build the country’s first nuclear power plant and its status as his country’s main gas supplier. Analysts dismissed the possibility Russia’s campaign in Syria would jeopardise its relations with the West’s Middle Eastern allies in the long-term. “It’s not zero-sum and it’s not black and white,” Rojansky said.